Tomorrow I start Law School orientation. 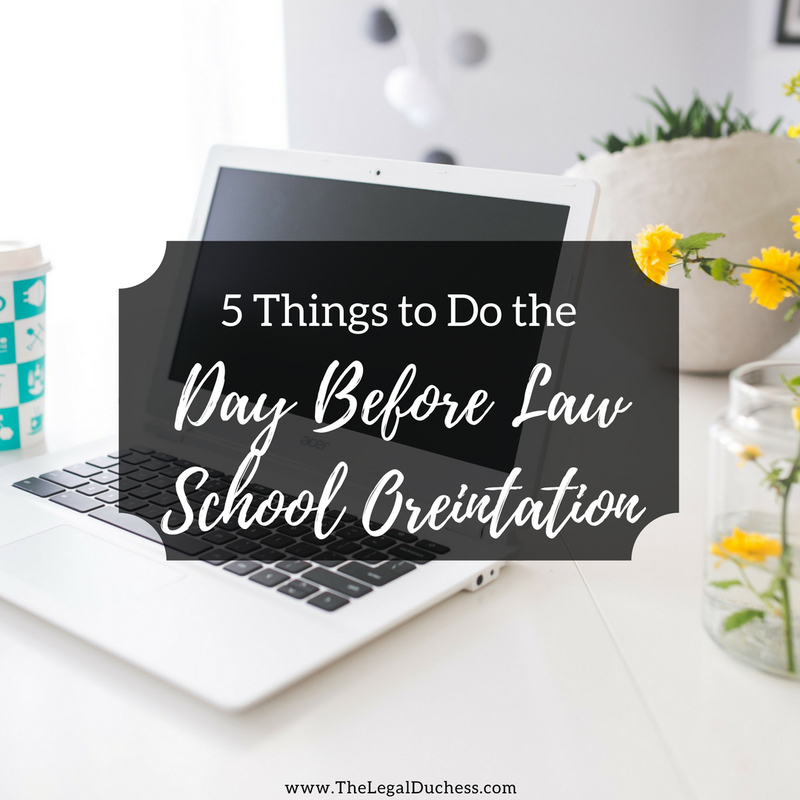 Tomorrow I take the first step in my legal career. Tomorrow, my life will change significantly.... but tomorrow is still 24 hours away so I am focusing on today. Today I am binge watching How I Met Your Mother on Netflix, listening to the Woodstock playlist loud as could be while I clean my house, taking my dogs for a walk despite the overcast, windy weather, cooking a yummy dinner for my Hubby and soaking up the last few hours of not being a Law Student. I am also finishing some Property reading, ironing my orientation outfits, packing my tote and preparing for the exciting day tomorrow. I feel less nervous when I am totally prepared so that is why I am getting everything done today. Here is my list for feeling prepared to start Orientation. To feel extra fierce for my first day as a Law Student, I am giving myself a manicure and pedicure to ensure that I have good first impression nails. I am also doing a face mask, a deep conditioner on my hair and whitening my teeth. I have always felt that looking your best can definitely help you feel your best. At orientation, you meet your peers and professors for the first time; you only have one chance to make a good first impression so any little things you can do to make yourself look and feel your best is worth it. 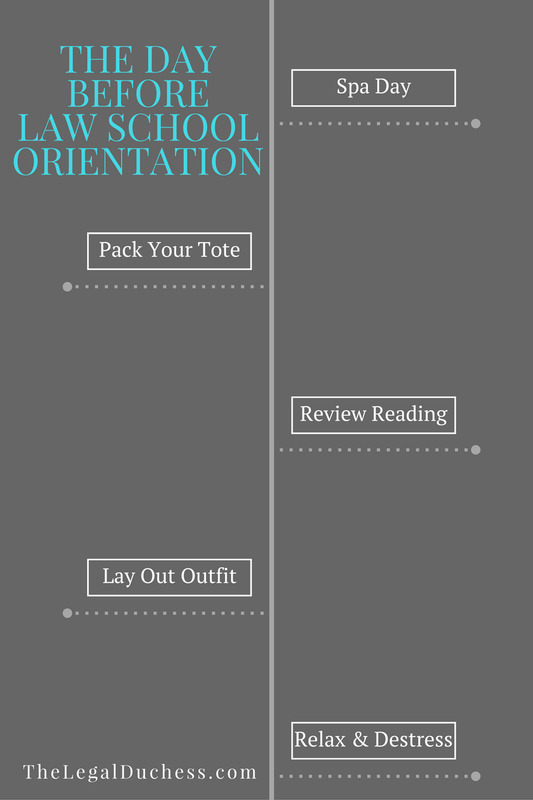 I am using my tote (similar) instead of my bookbag for orientation because I do not have much to carry and it goes much better with the required attire of business casual than a big heavy bookbag. I have packed my tote with the handouts, a notebook, pens and pencils, my computer, computer cord, wireless mouse, wallet, some beauty/toiletry necessities and a few granola bars just in case I get the munchies. Hopefully, I will have everything I need and then some. My school had a few cases to brief and a professional development handout as the required reading for the orientation workshops. I completed the work weeks ago so I just want to review the information in order to have it fresh in my memory and to be prepared to discuss it at orientation. Having a fierce outfit, including jewelry, laid out, ironed and ready to simply put on in the morning makes me feel so much more prepared. I know I simply have to wake up, put it on and can leave the house feeling ready to rock. For me, this is Yoga followed by hot tea but it could also be a workout, a coffee date or a bottle of wine. Whatever floats your boat and helps you to settle your nerves before the big day tomorrow. 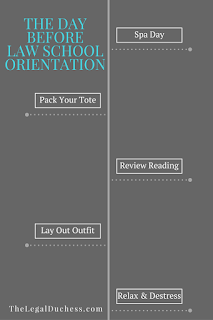 Despite all the stress and nerves, I am mostly excited about starting my Law School journey tomorrow. I cannot wait to meet my new peers, explore my new school and get started on this journey to my legal career. It is sure to be a very exciting day! Check back tomorrow night for my Orientation recap!